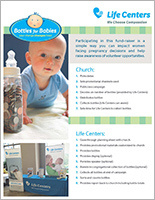 Use your change to change lives by launching a Bottles for Babies fundraising campaign. Pick a start and end date for your campaign. Your campaign should last 2 to 4 weeks. 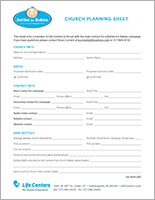 Order and pick up baby bottles from a Life Centers location. 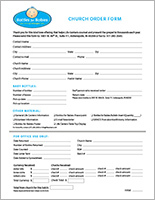 Announce the fundraiser to your group using one of the flyers below. Distribute the bottles, fill them with coins, checks or cash and return them to Life Centers. We’ll count all of the money and report back how much was raised. The Mother’s Day dates in the slides below are just examples. They can be customized to dates you set. For help with changing slides contact Brian Current.